From an initial choice of ships, (more unlockable by playing) the player has to destroy all the vortices they will face across the galaxies. 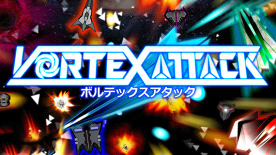 To implode the vortices, the player must destroy enemies to collect their energy. On top of the vortex there are two spheres: The player level (blue sphere) and the vortex level (red sphere or black hole). When the energy item sent by the player reaches the vortex, the blue sphere shrinks the black hole, symbolized with the red sphere. But in the other hand the black hole is constantly growing stretching the blue sphere. The game ends when the blue sphere makes the red one disappear or the red one grows to its maximum size. The concept is kind of new, reuses the concept based in Beekyr and improves it by removing the unnecessary bits.